Fireflies are not flies or bugs. They are beetles. Fireflies produce cold green light. Firefly larvae are sometimes called glow worms. Fireflies make their own light. Fireflies flash their light to attract mates. 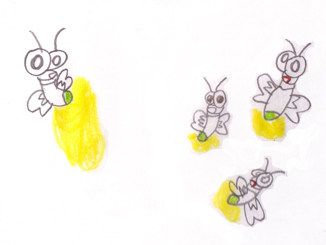 Fireflies flash their light to warm other fireflies of danger. I hope people care for fireflies and protect them.